MainAll NewsInside IsraelWhy won't ambassador attend Gush Etzion memorial? Why won't ambassador attend Gush Etzion memorial? Politics - or just scheduling? While media suggests US Ambassador forced to back out due to politics, embassy clarifies he was called to US. 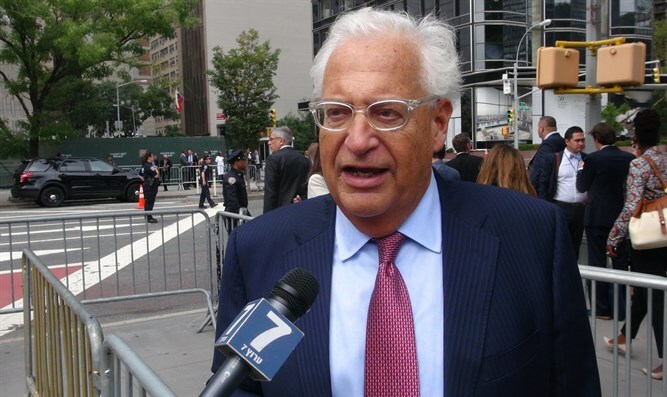 US Ambassador to Israel David Friedman has cancelled his planned appearance at a memorial service scheduled for next week in honor of an American Jewish teenager murdered in a terror attack in Gush Etzion two years ago. Earlier this week, Friedman told organizers from the Orot Yehuda Yeshiva in Efrat that he had accepted their invitation to a service honoring Ezra Yehiel Schwartz, an 18-year-old American yeshiva student who was killed along with two others in a terror attack in Gush Etzion south of Jerusalem in 2015. The memorial event, planned for next Tuesday, will take place in the Oz Vegaon park, near the scene of the deadly attack in November 2015 in Judea. Embassy officials never officially confirmed Friedman would participate, citing their policy of nondisclosure regarding the ambassador’s schedule. But officials from the Orot Yehuda Yeshiva say embassy security staff responsible for the ambassador’s safety had begun scouting out the location of the planned event and working with organizers to evaluate the viability of the ambassador participating, Yisrael Hayom reported on Tuesday. On Wednesday, however, organizers say the ambassador had clarified that he would be unable to attend the event.